Can kids and nice things peacefully coexist? If you're buying sofas or chairs anytime soon, consider easy to care for leather. But that doesn't mean that you have to live in a hovel until your youngest goes to college. You can still have nice things. Just choose and position them wisely. These living room furniture ideas can help you choose the right pieces for your family, and help you set limits on what can and can't be done on the furniture, so you can keep what you have looking presentable. Living room furniture ideas here are pretty simple: Choose kid- and pet-friendly furnishings with tough, stain-resistant upholstery. This will not be your White Period. Establish rules about protecting what you do have. No feet on the furniture. No food outside the dining room. Crafts only in the kitchen. Just because a room is kid-friendly doesn't mean it has to look like the playground or school cafeteria. Consider where you put things. You might want to relocate your precious Oriental rug to the dining room or your bedroom for the next few years. Or put it in an area of the room where the kids are unlikely to congregate. You spill on leather, you wipe it up. You spill on chenille, you'd better catch it fast. Leather is also more rip resistant. And it looks better longer. Most leather furniture is covered with protected leathers (also called aniline plus, top grain, pigmented leather, or everyday leather) because they are more durable and stain resistant. Leather is also preferable for people with allergies because you can remove all the dust from its surface easily with regular vacuuming. 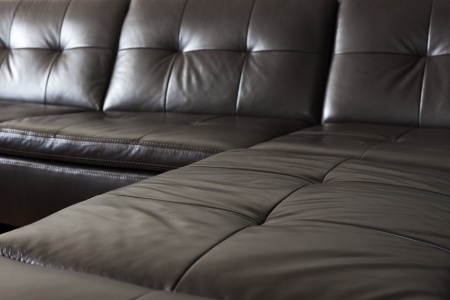 To preserve your leather furniture, keep it at least 2 feet away from heat vents or other heat sources. Don't expose leather furniture to direct sunlight or it could dry out and crack. Each week, wipe leather with a soft cloth. Each month, clean it with a gentle cleaning agent, such as liquid dish soap mixed in lukewarm water. Wipe, don't rub! If you already have sofas and chairs that you will go through early parenthood with, invest in slipcovers. They are trendy now and they actually look nice. Buy washable ones. Put out only what you truly love. Living rooms are infamous final resting places for knickknacks, tchotchkes, whatnots, and other decorative junk. Clutter is clutter, whether it's collectible Hummel figurines or garage-sale finds. Everyone has treasures, of course, and they do give a room personality and interest. But when you've got so much stuff that your eye cannot focus on any one thing, Mama, you gotta cut back. Organize items in eye-pleasing groupings of two or three objects. This works best if the items have a similar theme or if they provide contrasting textures, shapes, or colors. Don't pack every inch of surface space. Items stand out when they have room to stand out. If you've got a lot of stuff that you really like, try rotating collections. Having fewer objects on display is not only more attractive, it makes dusting infinitely easier. (They don't call them dust catchers for nothing.) And rotating collections will keep your living room looking fresh.